Kat: I wish Keith was here. He went ashore to find help for you! Natani: Ashore?! How long was I out? Kat: Ages! How do you feel? Are you in pain? 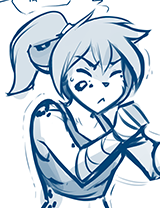 Natani: Actually, I feel… surprisingly okay. Maybe a little weak, but… it’s like a fog’s been lifted. One I didn’t know was there. Kat: I’m so relieved! Keith and I took turns, every day, caring for you. And I tried to do everything I could to keep you healthy. Natani: And I’m… really grateful! But… could you please get off me now? I’m feeling pretty exposed at the moment. Kat: O-oh! Right, sorry! Let me help you up! Kat: Don’t worry, though! Everyone else left— -the ship! Kat: Oh no! I forgot! We need to go, right now! There’s smoke and fire coming from the docks! I don’t know where it came from but I think the ship could be next! Natani: (thoughts) Sigh… Yep, there’s the pain.